Possessing a unique beauty and refined acting skills, Ann Dvorak (1911–1979) found success in Hollywood at a time when many actors were still struggling to adapt to the era of talkies. Seemingly destined for A-list fame, critics touted her as “Hollywood’s New Cinderella” after film mogul Howard Hughes cast her as Cesca in the gangster film Scarface (1932). Dvorak’s journey to superstardom was derailed when she walked out on her contractual obligations to Warner Bros. for an extended honeymoon. Later, she initiated a legal dispute over her contract, an action that was unprecedented at a time when studios exercised complete control over actors’ careers. As the first full-length biography of an often-overlooked actress, Ann Dvorak: Hollywood’s Forgotten Rebel explores the life and career of one of the first individuals who dared to challenge the studio system that ruled Tinseltown. The actress reached her pinnacle during the early 1930s, when the film industry was relatively uncensored and free to produce movies with more daring storylines. She played several female leads in films including The Strange Love of Molly Louvain (1932), and Three on a Match (1932), and Heat Lightning (1934), but after her walk-out, Warner Bros retaliated by casting her in less significant roles. Following the casting conflicts and illness, Dvorak filed a lawsuit against the Warner Bros. studio, setting a precedent for other stars who eventually rebelled against the established Hollywood system. In this insightful memoir, Christina Rice explores the spirited rebellion of a talented actress whose promising career fell victim to the studio empire. 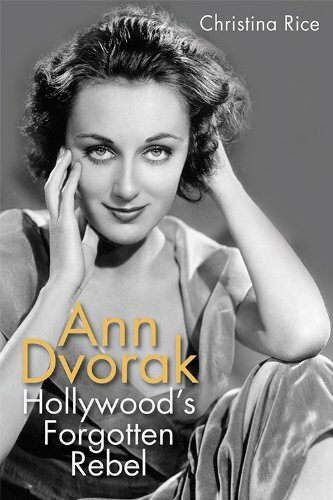 Ann Dvorak: Hollywood’s Forgotten Rebel is now available from University Press of Kentucky.